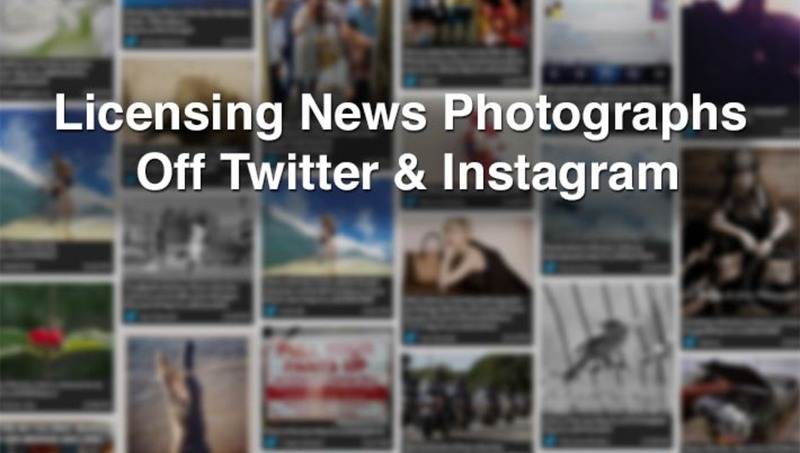 Licensing News Photographs Off Twitter & Instagram, Is This The Future Of Instant Media? When scooping other sources, being the first is king. Everyone knows that and the race is constantly moving faster and faster to do so. 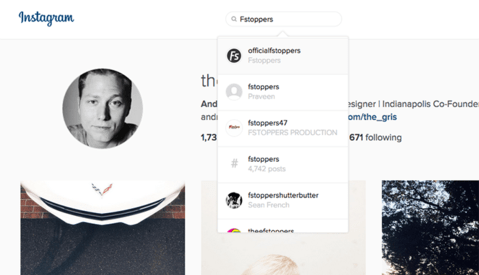 There has been some buzz around companies like CrowdMedia, Scoopshot, Rawporter and Blotter whose sole purpose is to get imagery out to major news outlets that have been scraped off of Twitter and Instagram. Boasting that you can make money off of this service really puts a bad taste in my mouth. I get that being fast and responsive to breaking news stories can have an important roll and I sort of see how this could make for breaking news coverage which happens in a remote location or in an inaccessible area. 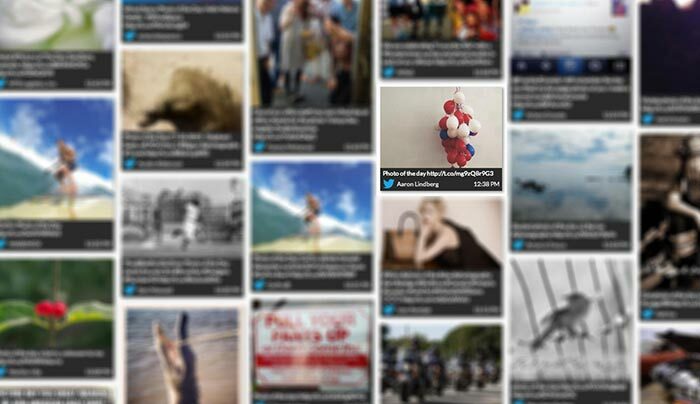 But where does finding socially searchable photographs and newsworthy images begin and end? There has to be a line drawn somewhere and someone, somehow needs to act as a filter or editor and make sure that all of these images that are being pushed to major news outlets have validity. I in no way think that facts need to be censored, I do feel that these companies are trying to make a quick buck from certain situations and in my opinion feels kinda scummy. I decided to a quick search on CrowdMedia and see what could dig up. First thing I searched for was "Photo of the day" which happened to be something I put out on Twitter 4 hours prior to writing this post. 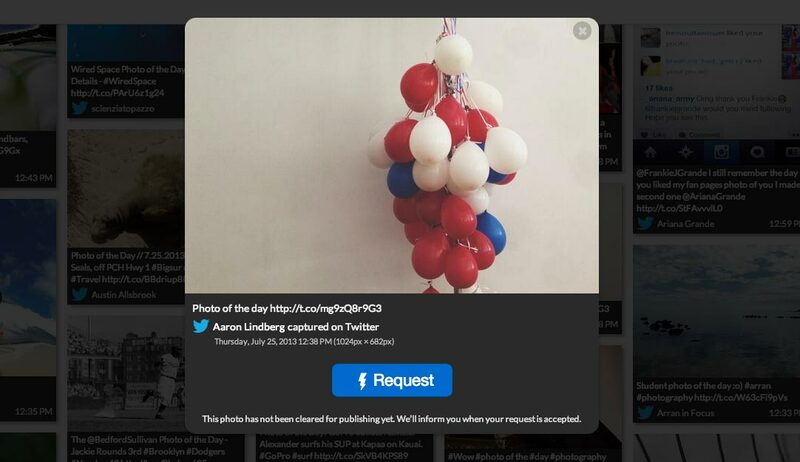 Sure enough, there it was, the photo of slumping balloons hanging in my studio that I posted on my Twitter account, ready to have someone contact me incase they want to license the photo. I certainly did not sign up for this, add this service to my account or in any way decide to have this show up in the results. It is a pile of balloons, I get it, it is no big deal, let's move on. Now imagine if that was someone who did not want to be on this site or had no clue there were on this website search. Maybe a face in the background of something that a random stranger took and uploaded shows up here, what then? Does it get edited out? 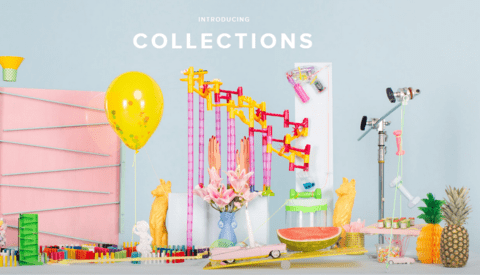 Though I stopped searching after finding this image, I can only imagine you can find other content that most people will not approve of being on this site, all conveniently packaged in a nice search function at the top of the website. I would like to know what you think about this. Is it a good thing to have a service that scrapes images from social media sites and pushes the photos onto other sources and give the camera operator a small cut? My cut will be 80%, no less. Of course if they refuse my 80% demand I will sue them for violating my copyright because I didn't give them permission to scrape my images. If you read the Twitter Terms of Service, I think your litigation might won't really stand a chance. subject to our terms and conditions for such Content use." Their actual legal term of service would be quite ambiguous. So, probably in their favor. Unfortunately, from the service provider's point of view, it is absolutely impossible to legally operate a site without overly broad terms of service. My day job is as a webmaster at a small university, and we basically have to have all of our students sign model release forms during registration in order to be legally covered doing what most people would consider normal for a higher education website. Without an overhaul of copyright law for the 21st century, government regulation of social media sites, or a drastic change of business culture--all of which seem equally unlikely to happen in a way that actually helps--TOS will remain all-encompasing and users of sites will have to determine what's better, to be screwed by not using the service, or to be screwed by the service. Interesting that you mention that about the release built into the registration forms Scott. Having shot a number of university catalogues, I find it amusing when students will say "you can't take my picture because I won't sign a release". My response seems to both shut them down and make them think when I say, "actually, I can because you signed a release when you applied to come here. That said, as a matter of courtesy, I won't take your picture because I'm a nice guy... but I can if you aren't happy with just accepting that courtesy." For the same reasons that you and others have stated, I am very careful of which social media I participate with and read the agreement fairly carefully having read anecdotal stories that came from Pinterest images being used by major publishing outlets "without consent". Social media is indeed a double edged sword. You are right, signing up for a service is agreeing to their rules (which are very blanketed to protect the company) as a user. At the moment, I doubt CM has an solid agreement with Twitter so by them throwing up a DMCA is a broad brush attempt to hide behind some usage agreement. Another example would be that popular celebrity gossip blogger who takes photos and draws on them and reposts under his own website. It is not right and screaming DMCA is not a shield from grabbing and using images, it doesn't make it right. I am interested to see how this would shake out if an outlet uses a photo without permission through any one of these companies. The chain goes - User to Twitter to GM to Outlet - each will point back to the other if someone got caught passing it down the line. Where do the legal agreements stop and start? Currently it is a grey area with no real explanation. My agreement is between Twitter and my, not me and CrowdMedia if CM is scraping my photos off of Twitter without going through Twitter first. If they have an agreement with Twitter that would come out in discovery and I'd drop my case at that point, my legal case. However I retain the rights to go through other media channels to go after the reputation of CM in the court of public opinion. That court has much more weight to it anyways. All social media wants to use your images, not to sell but to repurpose for targeted advertising on the same social media platforms. Everything they have changed in their TOC recently wrt ownership/licensing, searchability, tagging, etc, points directly to this. Thanks for the Rawporter mention Aaron. It's the still the social media wild west for photographers which is one of the reasons we created our platform. Our goal is to help people protect the photos and videos they post to Facebook and Twitter and even help them license that content if they are interested. There's a compensation component (they keep 80% Eric) if the copyright owner chooses to assign a price. We're simply trying to help both sides of the market conduct business legitimately and easily. It's obvious that social media has changed the content game permanently and that these photos and videos have value. Let me know if you ever want to chat? We are always interested in feedback and finding ways to improve things at Rawporter.